Utopia/ Dystopia is a portfolio of fine art prints created in the form of a deck of 52 playing cards. Curated by Artist and Printmaker, Miyo Stevens-Gandara, twenty-six artists were invited to create two cards for the deck to create their interpretation of utopia and dystopia. The deck of cards allows the project to bring many different artists and styles together creating one unified artwork- a full deck, redefining a traditional portfolio. The concept of a deck of cards is intended to reference many things- games of chance, luck, fortune, war, solitude, precarious situations (house of cards), magic, empire, and divination. It serves as a container for many ideas, and each artist has chosen their own direction. Weaving our Legacies Thru Prayer is an art exhibition by SHG Artists in Residence, Mujeres de Maiz. The exhibit features womxn, femmes, and GNC’s of color who use prayer to set intentions, send positivity and gratitude. This year's theme represents ties that people make to one another and to paths of healing and self-love. As womxn of the earth connected to spiritual powers, we set prayers through affirmations for self-respect and health, through healing friendships that we foster, through mandos we make to ánimas and santos, through dedication to family, and through the multiplicity of borders we cross and inhabit. The exhibition features works by artists Adriana Arriaga @adrianalaartista, Alma Lopez @almalopezgda, Amarise Carreras @amarise_c, Andrea Ramirez @mextica, Celina Jacques @celinajacqueslmft, Clara Ligia Chavez Vazquez, Claudia Mercado @cinematika2010, Cuca Rivera @_antesdemi_, Emilia Cruz @cruzemilia, Emilia Garcia @burnttortilla, Eva Lopez @ehvahloonah, Jeaneen Carlino @jeaneencarlino, Lara Medina, Lilia Ramirez @liliflorart, Linda Vallejo @lindavallejoart, Margaret Alarcon @quicart, Mayahuel Rosado @maya__sol, Megan Pennings @memepenny, Monica ‘Moni’ Perez @the_monishow , Nayeli Guzman @nayeliguzman1, Rafa Tarin @brushfire575, Tashina Emery @tashinaleeemery, and Yolanda Gonzalez @yolandagonzalezart. The SHG Gallery is open Monday - Friday, from 10am-5pm and select weekends during programming or by appointment. Group guided tours available by appointment. 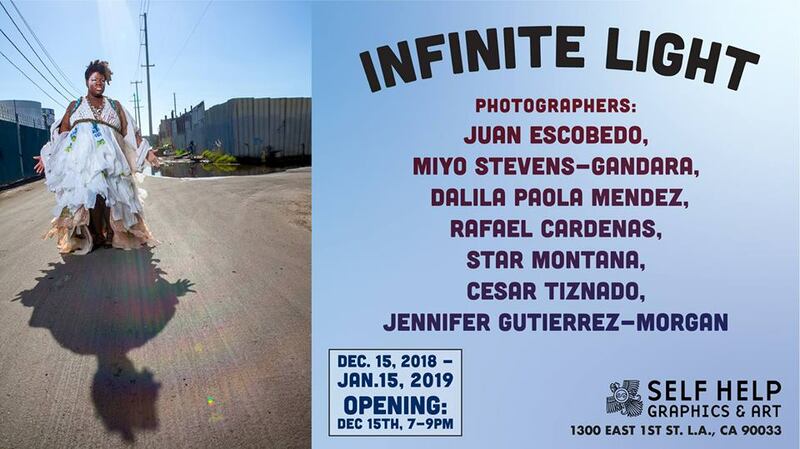 Self Help Graphics is pleased to present #InfiniteLight, an exhibition co-curated by Juan Escobedo and Miyo Stevens-Gandara, on view at the SHG Gallery through January 15, 2018. The works selected bring to light the individuals, communities, landscapes, and objects that are often overlooked by mainstream media and in daily life. 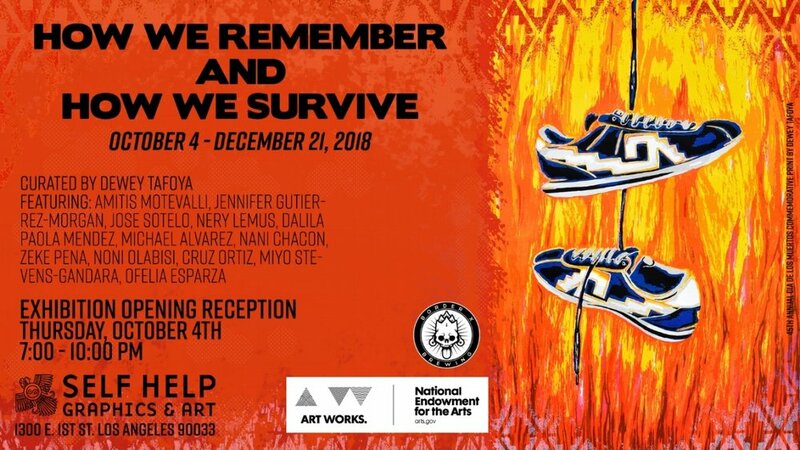 Self Help Graphics & Art Presents its 45th Annual Dia de los Muertos Exhibition Opening Reception, "How We Remember and How We Survive," Thursday, October 4th 7-10 p.m. Curation and Commemorative Print by SHG Artist in Residence/ Printmaker, Dewey Tafoya. Featuring Artists: Amitis Motevalli, Cruz Ortiz, Dalila Paola Mendez, Dewey Tafoya, Jennifer Gutierrez-Morgan, Jose Sotelo, Michael Alvarez, Miyo Stevens-Gandara, Nani Chacon, Nery Gabriel Lemus, Noni Olabisi, Ofelia Esparza and Zeke Peña. Brews provided by Border X Brewing. Self Help Graphics & Art (SHG) and California State University, Los Angeles (Cal State LA) proudly present Entre Tinta y Lucha: 45 Years of Self Help Graphics & Art at the College of Arts and Letters Fine Arts Gallery, from August 21, 2018 through September 29, 2018. Admission is free and open to the public. The exhibition celebrates the 45th Anniversary of the East Los Angeles cultural and community art organization, Self Help Graphics & Art (SHG) and looks back at over four decades of the organization’s artistic innovation and excellence and organizational resilience, by featuring a display of over fifty fine art prints from throughout the organization’s history. Curated by Cal State LA Faculty, Michelle Lopez, MA/MFA and Victor Hugo Viesca, PhD., in partnership with SHG, the exhibition also looks forward to an exciting evolution of Chicana/o and Latinx aesthetics.A press preview day at the Fine Arts Gallery (by appointment only) is slated Monday, August 20, from 9 a.m. to 5 p.m., with an opening reception on Saturday, August 25, from 5 p.m. to 8 p.m. The Fine Arts Gallery is located at Cal State LA's main campus and is open Monday-Friday, 12 p.m.-5 p.m. The gallery will be open extended hours, 6 p.m.- 9 p.m., during exhibition programming on the following Thursdays:September 6th, September 13, and September 27. “Self Help Graphics & Art is proud to partner with Cal State LA for our 45th Anniversary retrospective, which includes over four decades of fine art prints and curated programming that explores our organization's impact in the printmaking and cultural arts community throughout Los Angeles and the nation. We look forward to sharing this exhibition and programming with our local community and encourage the public to visit Cal State LA’s Fine Arts Gallery while this free exhibition is on view," said SHG Acting Director, Betty Avila. Entre Tinta y Lucha: 45 Years of Self Help Graphics & Art marks a historic collaboration between Self Help Graphics & Art and Cal State LA, with support from the Fine Arts Gallery-- two community institutions with roots in the Eastside of Los Angeles. “Self Help Graphics is one of Los Angeles’s most beloved cultural assets. The College of Arts and Letters is not just a place where LA’s future culture makers come to study, it is also a place where our community’s cultural assets are amplified and celebrated,” said Linda Essig, dean of the College of Arts and Letters. A mobile art workshop (September 6 from 7 p.m.-8:45 p.m.) and series of free artist-led panels will accompany the exhibition at the Fine Arts Gallery, to get perspective from the artists themselves about the history and value of the organization to the community and the greater Los Angeles art world. Topics include “Exploring Technical Excellence” (September 6 from 6 p.m.-7:15 p.m.), “Cultural Significance & Social Justice in Printmaking” (September 13 from 6 p.m.-7:15 p.m.), “Embracing Identity in Chicana/o & Latinx Art” (September 13 from 7 p.m.-8:45 p.m), “Maestras” (September 27 from 6 p.m.-7:15 p.m.) and “Challenging the Binary: Queerness in Printmaking” (September 27 from 7 p.m.-8:45 p.m.). Hacer, Deshacer, y Rehacer brings together a selection of historical and contemporary viewpoints on the Latinx body and the city of Los Angeles. Primarily based out of Self Help Graphics & Art’s collection, this exhibition is founded on representations of bodies and spaces originated by Chican/o artists of the 1970s, introducing contemporary perspectives that return and challenge many of those same themes and renditions. Spanning more than a forty-year time period, the exhibition intends to foster an intergenerational conversation, placing recent artistic production into dialogue with their historical antecedents. Building off of SHG’s groundbreaking “Homohombre LA” experimental print atelier of 2007 which provided a platform for queer brown artists, Hacer, Deshacer, y Rehacer brings together depictions of the body and space. Images such as the tough demeanored ELA cholos of George Yepes’ untitled drawing is placed alongside Rigo Maldonado’s Hard To Swallow confrontation with Latino machismo. The exhibition also pairs landscapes, like the utopian reimagining of South Central in Trenely “Clover” Garcia’s print, Los Caminos de la Vida, with master draftsman Frank Hernandez’s Untitled barrio landscape print. This curatorial premise focuses on the artistic tensions involved in making, unmaking and remaking personal and collective Latinx identities. Hacer, Deshacer, y Rehacer is curated by Juan Silverio under SHG's Young Curator Program. Reclaim! Remain! Rebuild! Posters on Affordable Housing, Gentrification & Resistance at Self Help Graphics. Reclaim! Remain! Rebuild! is an upcoming exhibition that will feature political posters of topical issues such as affordable Housing, gentrification and community resistance, produced in partnership with Self Help Graphics, the Center for the Study of Political Graphics and the Eastside L.E.A.D.S. coalition. Self Help Graphics & Art’s Annual Print Fair and Exhibition (#SHGPrintFair) is a highly anticipated one-day opportunity for art lovers to acquire new, limited edition, fine art prints created by dozens of artists at SHG between 2017-18, through our Professional Printmaking Program. The Annual Print Fair & Exhibition features serigraphs, monoprints, as well as new relief and intaglio print editions. Although the #SHGPrintFair has passed, the exhibition continues at the SHG Gallery through August 3, 2018 and features work by artists such as Margaret Alarcon, Clover, Pepe Coronado, Sandra Fernandez, River Garza, Luis Genaro Garcia, Rosalia Lopez, Douglas Miles, Dalila Paola Mendez, Malaquias Montoya, Zeke Peña, Kimberly Robertson, Cynthia Velasquez and many more! Shop recent prints online anytime at bit.ly/SHGShop. Visit our exhibition ELA Icons, in partnership with Tamayo Restaurant. ELA Icons is a tribute to the work of Self Help Graphics' Professional Printmaking Studio, our artists and to Tamayo Restaurant in East Los Angeles, established in 1984. Select prints from our archives will be on view at Tamayo Restaurant & Gallery, on the second floor. Tamayo Restaurant is a cultural landmark built in 1928 purchased by TELACU in the 1980s as their contribution to celebrating the rich heritage of California's Latino community. The restaurant is named after internationally renowned artist Rufino Tamayo. The restaurant proudly displays a stunning collection of his art amongst other Latin American and Chicanx icons. A collaboration between Mujeres de Maiz, Self Help Graphics & Art, InnerCity Struggle, and The California Endowment. The Art exhibition features womxn of color that are honoring the 50th Anniversary of the Walkouts focusing on their contributions and intergenerational organizing. The exhibition includes archival material, work by walkout participants, and new work inspired by the movement. Exhibition runs from March 17th to May 30th, 2018 during regular hours and on special events. Additional support provided by CSULA, The Department of Chicanx and Latinax Studies. Join us for a special Mujeres de Maiz (MdM) Live Art Show & Exhibition honoring 21 Years of MdM & Honoring Womxn Warriors - then and now. An Interdisciplinary, Intercultural, Intergenerational Art Festival and Exhibition Opening Reception including performances by Entre Mujeres, Medusa, and more. The Art exhibition will feature womxn, femmes, GNC of color who use prayer ties to set intentions, send positivity and gratitude. This year's theme represents ties we make to one another and to our paths of healing and self-love. As womxn of the earth connected to our spiritual powers, we set prayers: through affirmations for self-respect and health, through healing friendships we foster, through mandos we make to ánimas and santos, through our dedication to family, and through the multiplicity of borders we cross and inhabit. Saturday, March 9th, 6-9pm. $10-100, All Ages. Exhibition scheduled through March 2019 during SHG's regular hours and on special events. An Interdisciplinary, Intercultural, Intergenerational Art Festival and Exhibition Opening Reception featuring womxn of color, femme, GNC & QT/WOC artivists. *Parking is limited & available on surrounding streets. Art on flyer by Liliflor Art. *PLEASE NOTE*: Tickets are General admission, with limited seating. Ticket does not guarantee seating. Different prices does not mean better seats. The different costs are sliding scale donations according to what you can donate for your ticket(s). Never been to a Mujeres de Maiz event? Don't Miss it! Join the event that has inspired circles and events across the Southwest! All Ages, general admission w/ very limited seating. *Please inbox us for accommodation needs. Event is not scent free as we use aromatic medicines/smudges. Alcohol and Drug Free Event for the health of our communities. Event intends to be a Brave and Safe Space. Event is all ages/genders/sexualities, please honor the elders and children. 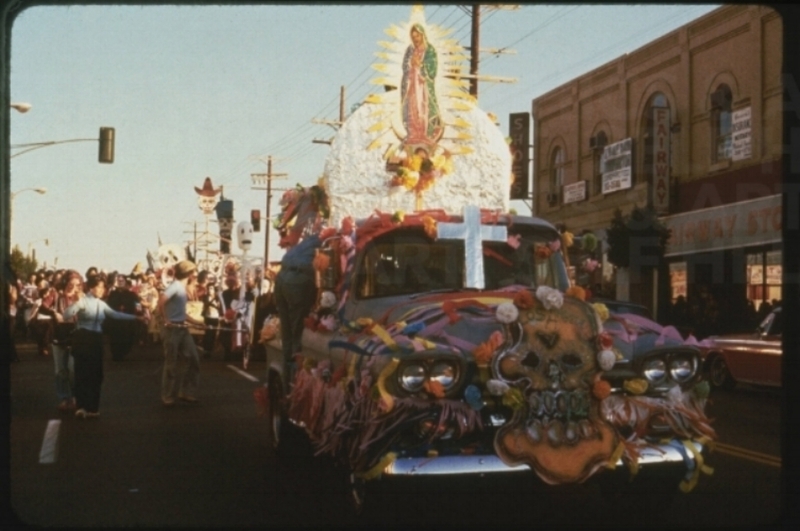 Opening Reception: Día de los Muertos Exhibition "How We Remember and How We Survive"